Gustave Dor (1832-83) was perhaps the most successful illustrator of the nineteenth century. His Dor Bible was a treasured possession in countless homes, and his best-received works continued to appear through the years in edition after edition. His illustrations for Dante's Divine Comedy constitute one of his most highly regarded efforts and were Dor 's personal favorites. The present volume reproduces with excellent clarity all 135 plates that Dor produced for The Inferno, Purgatory, and Paradise. 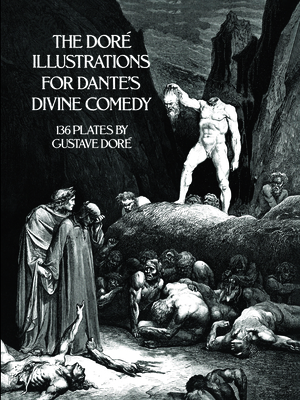 From the depths of hell onto the mountain of purgatory and up to the empyrean realms of paradise, Dor 's illustrations depict the passion and grandeur of Dante's masterpiece in such famous scenes as the embarkation of the souls for hell, Paolo and Francesca (four plates), the forest of suicides, Tha's the harlot, Bertram de Born holding his severed head aloft, Ugolino (four plates), the emergence of Dante and Virgil from hell, the ascent up the mountain, the flight of the eagle, Arachne, the lustful sinners being purged in the seventh circle, the appearance of Beatrice, the planet Mercury, and the first splendors of paradise, Christ on the cross, the stairway of Saturn, the final vision of the Queen of Heaven, and many more.